Getting rid of fat, especially those stubborn love handles can be sometimes frustrating. Find out how you can lose those stubborn bulges & stay curvy at all the right places. Wondering what’s causing all that excess fat? The biggest culprit is your calorie intake. Calorie is a unit to measure energy & if you are eating too many & not burning enough it can lead to fat. But this does not mean you have to cut back on food. 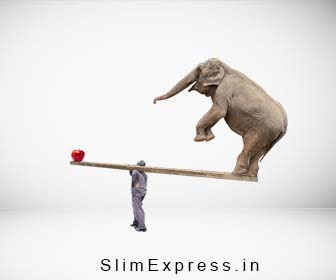 In fact when you do extreme dieting, your metabolic rate drops to conserve energy. And once you switch back to your normal diet; you gain weight faster than before. There are two types of fats in our body. One is Subcutaneous fat found directly under the skin. It’s the fat that can be pinched & felt. Then there is Visceral or “deep” fat. It wraps around the inner organs (stomach, liver, intestines etc.) and spells trouble for your health. Visceral fat increases risk for diabetes, heart disease, stroke, and even dementia. The circumference of the waist is used as a simple measure to know the amount of visceral fat a person has. As per WHO (World Health Organization) waist circumference should be below 90cm (36 inches) in men & 80cm (32 inches) in women. We all love to have a high metabolism but not all of us are blessed with it. However you can boost your metabolism by few simple things. First of all; eat more frequently! Having small meals every 3-4 hours improves your metabolism. Also regular exercise for 30-40 minutes every day keeps your metabolism up. Jogging, cycling, swimming are some good exercises which workout entire body. They improve your cardio fitness as well tone your abs. Yes! ‘Go Green’ is a mantra that not only helps the environment but also works wonder on your body. Including raw vegetables & salads in your diet help to improve digestion by adding the required fibre. Some veggies like celery, tomatoes, cabbage & asparagus are known to improve the metabolism. Adding green tea helps to flush out toxins from body & relive bloating caused by water retention. When we exercise our brain sends signals to the corresponding muscles. Ion Magnum mimics these signals so that the muscle tissue is made to believe that it is performing a muscle-toning workout. In return what you get is the benefits of an intense, professional workout minus the pain, physical exertion or inconvenience of conventional exercise. It not only reduces fat but also builds muscles & improves muscle mass. This naturally increases metabolic rate which further initiates weight loss. High Foculised Ultrasound treatment (HFU) sends targeted ultrasound energy to burst fat cells without damaging surrounding tissues. The released fat is used up in the body. Our body cannot form new fat cells after a specific age, so the destroyed fat cells are never replaced.